Easily the best night of regular season baseball in my lifetime. I’ve even heard all the talking heads say there’s never been a night like this in the history of baseball. That’s a long time, folks. Everything was just incredible. If you’re a Red Sox or a Braves fan… you were probably too depressed at the end of the night to appreciate the grandeur of what happened last night, Wednesday, September 28th, in Major League Baseball. If you’re a Rays or Cardinals fan… you are still floating in the clouds, and most likely hungover. It was all so amazing. There was almost too much to comprehend. When it was all said and done, I ran upstairs, so jacked full of adrenaline , I yelled at my wife, “Babe, you’re never gonna believe what just happened! !” She went on to humor me for the next 5 minutes, (get your minds out of the gutter, assholes) kindly smiling, as I went on a micro-machine-man-esque rant about the night of baseball that had just unfolded. Bless her heart for pretending to care. The Cardinals took care of business early, crushing the lowly Astros 8-0, so they could take their seats in the clubhouse and watch the Braves try to beat the Phillies. They didn’t. With a one-run lead in the 9th, Craig Kimbrel, the best reliever in all of baseball for fantasy owners in 2011, blew the save. Extra inning drama. They ended up losing to the Phils in the 13th inning, sending the Cardinals clubhouse into an absolute frenzy. Yadier Molina’s finely manicured eyebrows spent the night dodging champagne sprays. 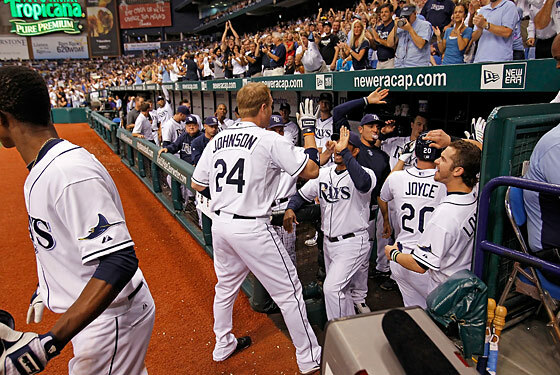 In a night of unbelievable moments, the Dan Johnson home run for the Rays had to be the most unbelievable, right? 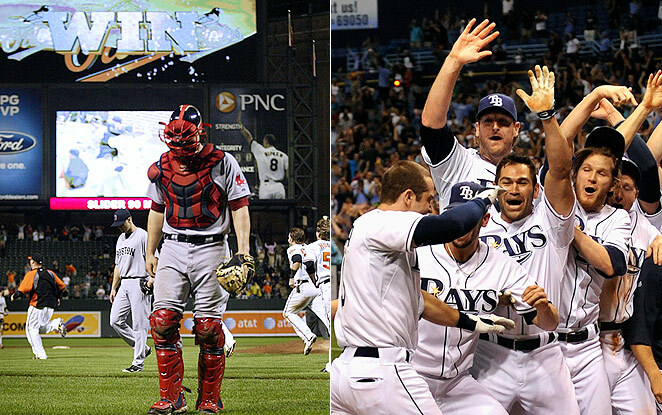 2 outs in the bottom of the 9th, after the Rays had already fought back, down 7-0, to bring it 7-6. Johnson, a .108 hitter, hadn’t had a hit since April 27. Then he blasts a linedrive down the right field line for a home run. Tie Game. Twitter blew up. So did Tropicana Field. Extra innings. Lots of little drama here and there, but at this point everybody was watching the Red Sox game. The Sox, up 3-2 in the bottom of the ninth. In comes Papelbon, and he promptly strikes out the first two Orioles. Next better, same determination, same flaring nostrils, same arrogant smirk, same idiotic death stare. The next 3 batters are dudes I’ve never heard of…Chris Davis, double. Then one strike from victory, Nolan Reimold, run scoring double. Game tied. Then, Robert Andino comes up… boom single. Carl Crawford dives, winning run scores, the baseball gods smile, and Baltimore rushes the field. Papelbitch. ESPN quickly switches over to the Rays game and within a span of three minutes, Evan Longoria does the improbable… blasts a line drive home run over the left field wall and Tropicana field goes insane, a nation of baseball fans do the same. Here’s how ESPN summarized the moments leading up to it. “Tie Game in Baltimore…In St. Pete, Upton steps in to hit against Scott Proctor. Then he steps out because the crowd is roaring over Reimold’s double. Then he struck out. 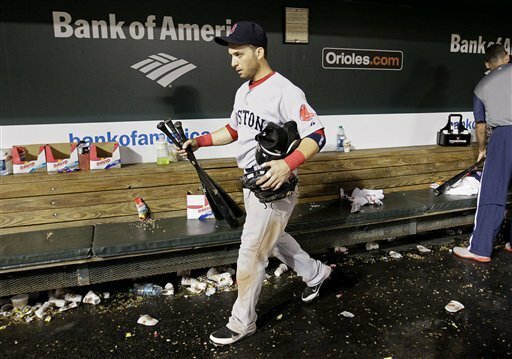 Longoria was next, and he stepped out twice because the crowd was reacting to the Andino’s game-winner in Baltimore, a base hit to left that finishes Boston. The Red Sox players walk into the visitor’s clubhouse at Camden Yards just in time to see Longoria take Proctor’s 2-2 pitch over the short fence in left. This site is reporting that the probability of last nights events all happening the way they did was a 1 in 278 million chance. Just amazing. Breathtaking, really. I love you, baseball. With all of ‘my’ teams not making the playoffs, I still love you. May this post-season bring the same joy to your fans that game 162 brought. This entry was posted in Baseball, MLB and tagged al, Astros, Braves, Cardinals, Carl Crawford, Chris Davis, Dan Johnson, Dan Johnson home run, Evan Longoria, Major League Baseball, MLB, nl, Nolan Reimold, Orioles, Phillies, Rays, Red Sox, Robert Andino, Tropicana Field, wild card, Yankees. Bookmark the permalink.